Dasher and Dancer and the rest of the team tiptoed across the snow-covered roof. 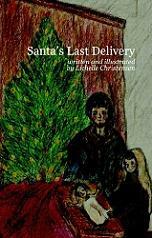 As the sleigh pulled in, Santa pushed the hand brake forward, and the sleigh slid to a smooth stop. Santa threw one leg, then the other, over the sleigh and slipped to the roof. The snow crunched under his feet as he walked past the reindeer. He patted each one on the head and called them by name. “Prancer, you’ve got your usual good marching prance.” Prancer kicked up his feet and snorted his gratitude. All the reindeer responded with soft pawing in the snow.